Who peppers the highest is surest to please. 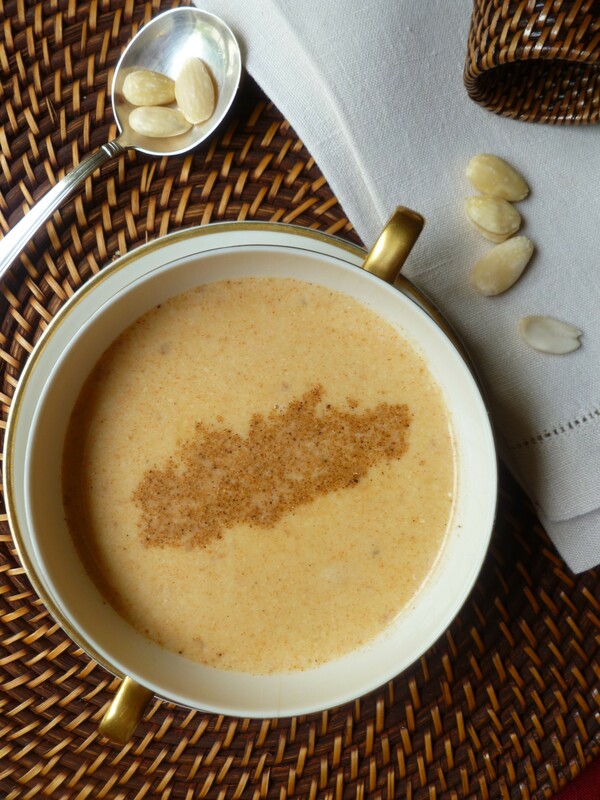 Of course not all highly spiced styles of cooking fall under this reproach…but this soup would if not well and distinctly spiced, without harshness, as befits a dish whose base is the delicate flavour of the fruit of the almond tree. 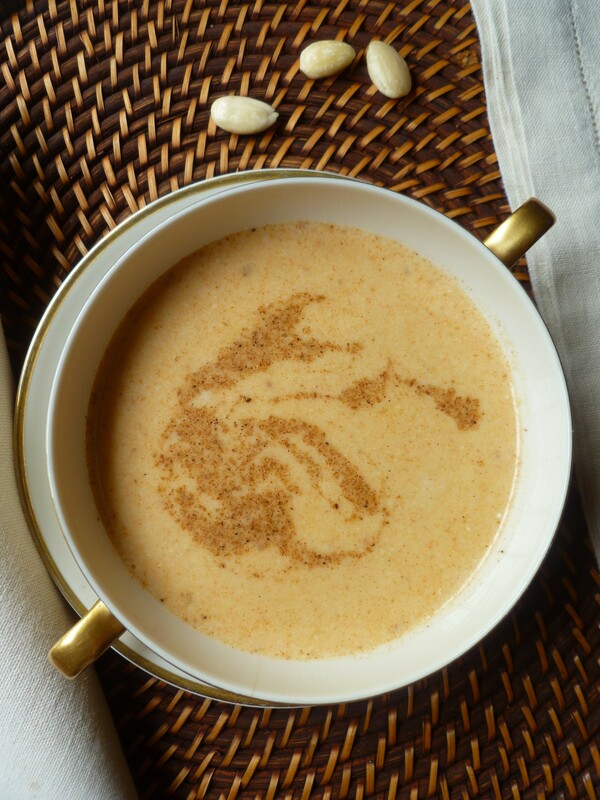 A Timing Note: If the soup is made with the homemade chicken stock described in Part II below, it’s a good idea to make the stock the day before and refrigerate it so that the congealed fat may be easily removed before using the stock for the soup. 1 and 1/2 quarts (6 cups) of Chicken Stock: There is a recipe for a homemade version below in Part II. 6 cups of water and 2 Chicken Bouillon Cubes will be a fine substitute. 1. Put into the pot the chicken stock, the paprika, the dry mustard, cloves, and thyme. Bring the soup base to a simmer, covered, for 30 minutes. 2. 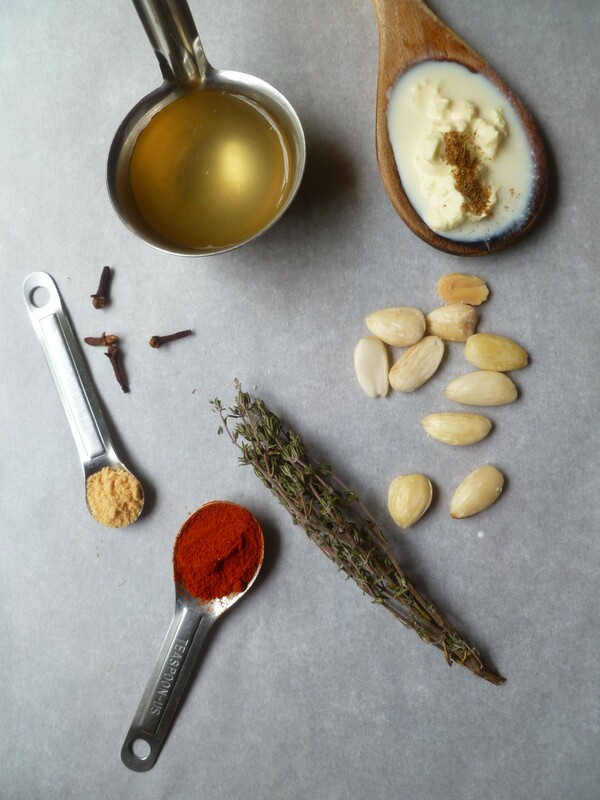 Add the ground almonds and garam masala and stir to blend thoroughly. Process the soup in a blender or food processor in a couple of batches and return it to the pot. 3. Add the cream and the cayenne pepper. 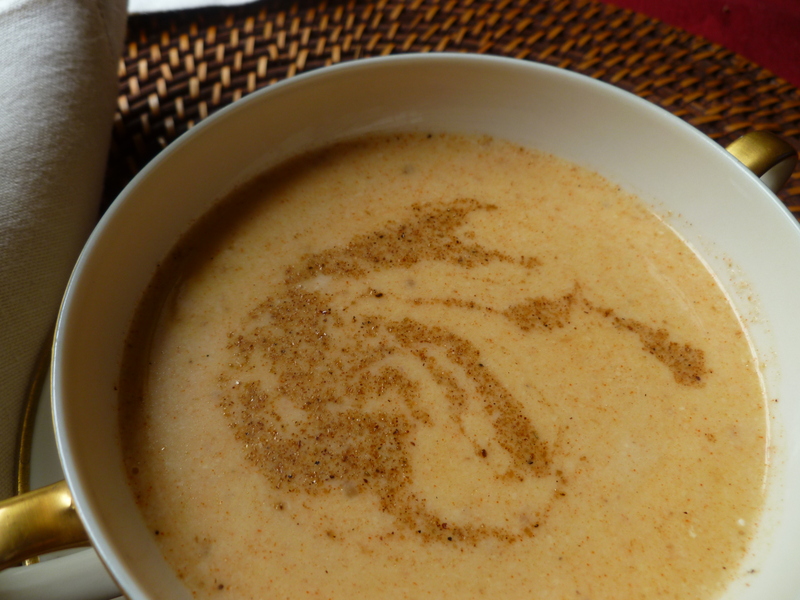 (Add a little extra cream and stock if the soup has reduced a little more than you would like.) 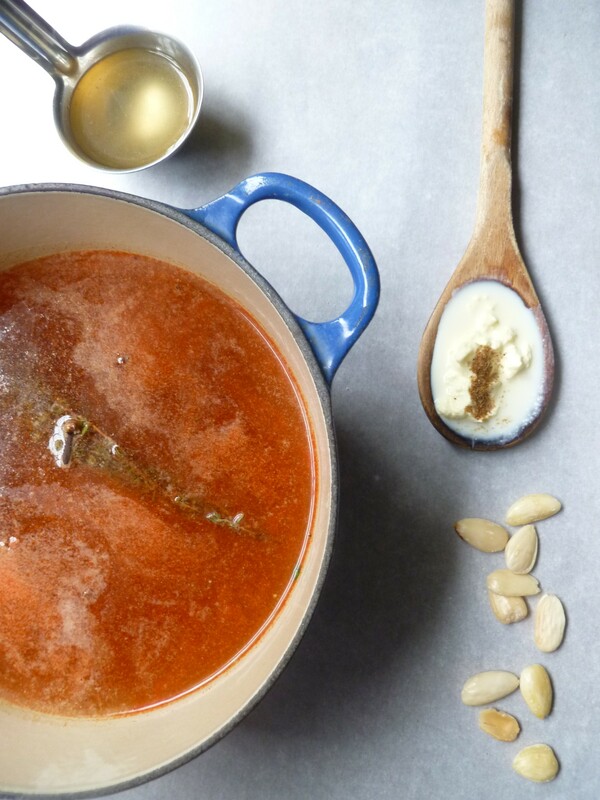 Heat the soup without letting it come to a boil and taste for seasoning. 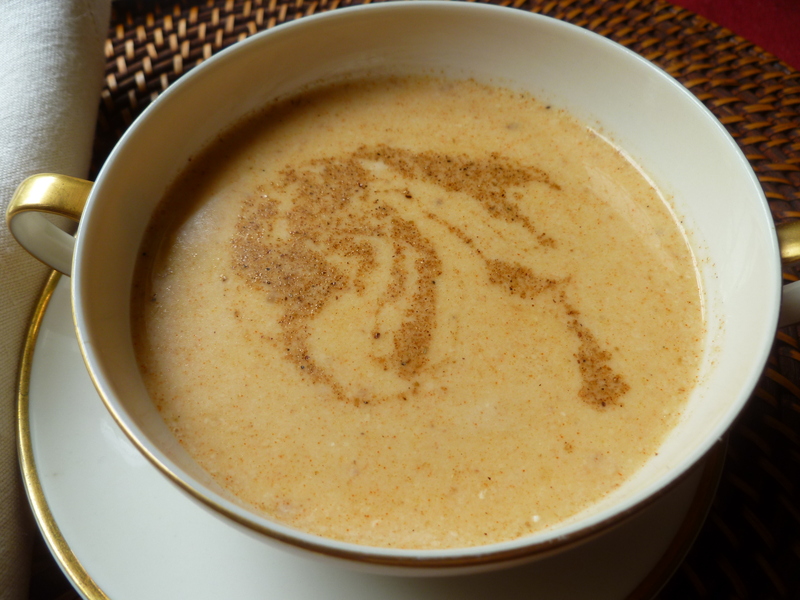 Divide it among bowls and decorate each with a swirl of garam masala spice, if you like, as described below in Part III. 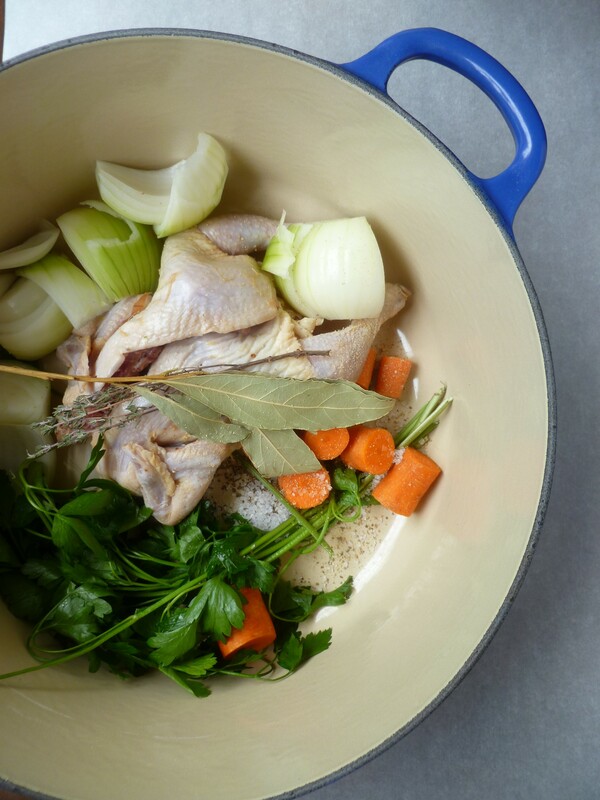 a small Chicken, such as a Poussin or a Squab, cut along the backbone so that it relaxes down in the pot: the photographed stock is made with a poussin which weighs a little under a pound…but any small-ish chicken will do. 1. Put all the ingredients into the stockpot and bring them slowly to a boil over medium heat. 2. Adjust the heat so that the liquid in the pot simmers, partially covered for 2 and 1/2 hours. During the first 2 hours, add water to the pot when necessary to keep the ingredients just covered in liquid. Add no more water during the last 30 minutes of simmering. 3. Place the colander over a large bowl or pot and strain the stock through the colander. 4. When the stock is no longer steaming, refrigerate it overnight. 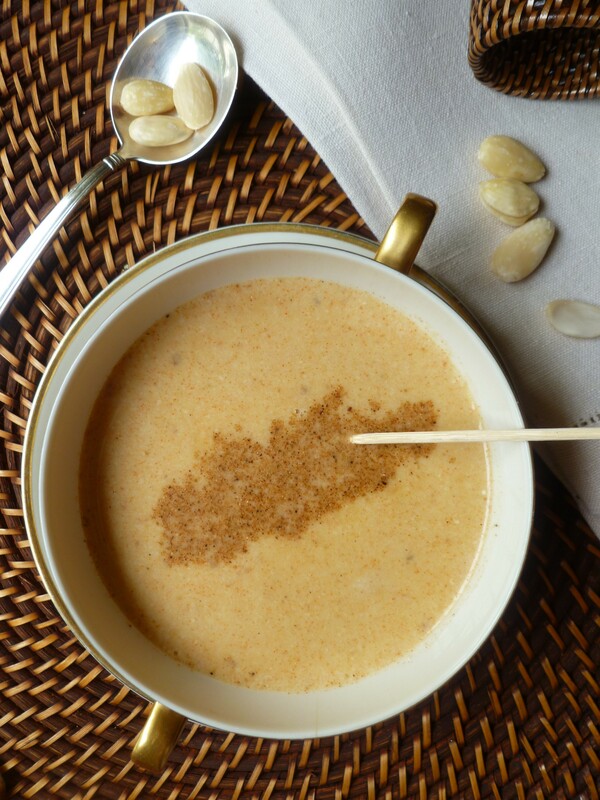 The next day, remove the congealed fat and use the clear stock for making Spiced Almond Soup. 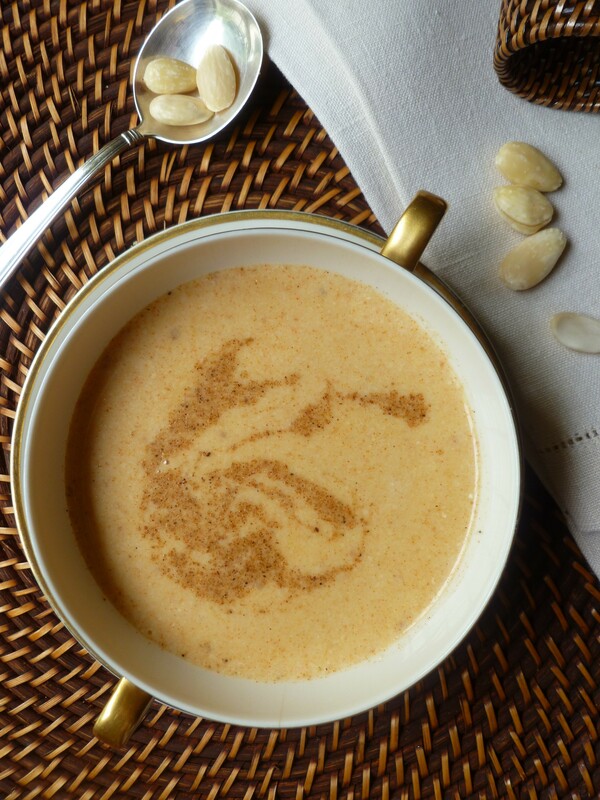 A Note: The First Course of the Dinner Menu, Dinner at Journey’s End is Spiced Almond Soup. The recipe is based on one in Mr. Helmut Ripperger’s book on Spice Cookery (1942) which is available here in the Hathi Digital Trust Library, along with several other of his nice little cookbooks.